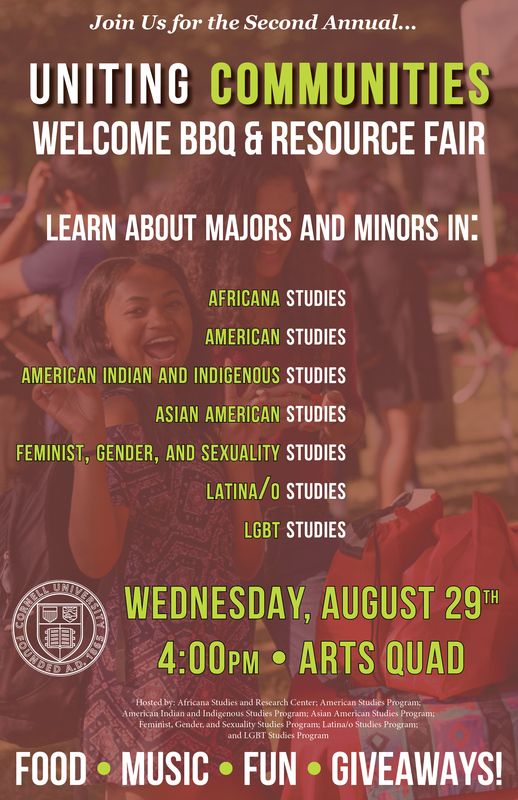 Come learn about majors/minors in Africana Studies; American Studies; Latina/o Studies; Asian American Studies; American Indian and Indigenous Studies; Feminist, Gender & Sexuality Studies; and LGBT Studies. ALL WELCOME • FOOD • MUSIC • FUN • GIVEAWAYS! Hosted by: Africana Studies; American Studies; American Indian and Indigenous Studies; Asian American Studies; Feminist, Gender & Sexuality Studies; Latina/o Studies; and LGBT Studies. Rain location Klarman Hall Atrium!